After David’s successful military campaigns, which included territories from the Tigris to the Nile, he desperately sought the presence of God. Without Mosaic sanctions or direct permission from God, he brought the Ark of the covenant to a tent he built outside his palace. He created a choir (praise team) consisting of men and women, three shifts a day, which he enjoyed for the rest of his life. Jehovah loved David’s desperation so much he “commanded it through the prophets” and it continued through the inauguration of Zerubbabel’s temple (516 BC). 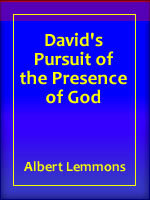 What makes this of such importance to us is that the brother of Jesus, the spokesman for the apostles in Jerusalem, quotes the last chapter of Amos to include “rebuilding David’s fallen tent,” or desperation for the presence and worship of God, along with Gentiles who were now in right standing with God as were the Jews. This album contains six CDs.